We got back finally late on the night of the 11th, the commander of the convoy having wandered around and taken longer than he should have — and we had to anchor out in the outer harbor, going in early on the morning of my birthday. The Capt. had sent in the amazing report of: wounded–none; killed–none; amount of damage to ship–none; amount of ammunition expended–none. He was pretty proud of that — it really was something. Later that day (the 12th) I went to the hospital with Mr. Mockbee and found he had a chip fracture of the head of the humerus – Capt. Galt, the orthopod, told me what to do with him, but Mr. Mockbee refused to wear a sling for more than 5 minutes, and somehow he has been lucky and his arm hasn’t hurt him much at all, despite all the climbing up and down on the ship. 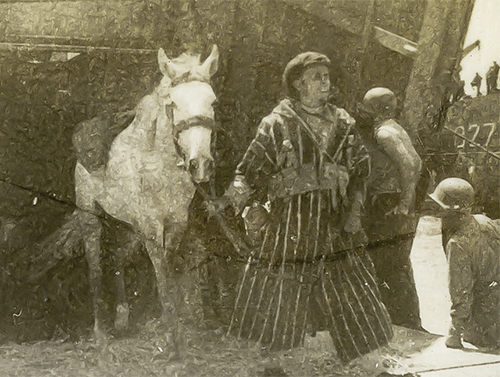 That afternoon we got a shock — we found that we were to have a still stranger cargo on the next trip — Moroccan troops complete with horses, mules, fleas, lice, etc. You should have seen the mob of them. I think one other ship got some of them, but we got the large majority and all the animals. It was quite a sight to see them trooping aboard. That dock was full of spectators watching the quaint sight. They had piled a tremendous amount of sand and hay aboard so that the animals could eat and wouldn’t wreck their feet on the hard tank deck and when they were crowded in it was something that can not be easily imagined. And the smell is hard to imagine also. 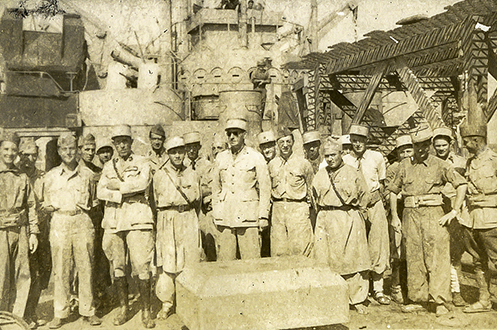 Our cargo of Moroccan soldiers came from Marrakech, it turned out, and they had some very nice French Officers in command. They all had lived in Africa most of their lives, all except the one who was official interpreter and liaison between the French and Americans. 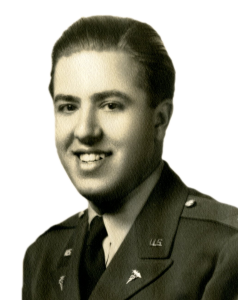 One of the officers was a young doctor who had his training at Lyon. I got along fairly well talking to them. Some of the things were most interesting. Supposedly these troops are really red-hot fighters and do not take prisoners, as the story goes that they get paid by the number of enemy ears or big toes they bring back. Nice, eh! We had lots of trouble at first, as the men didn’t know what a toilet was for. And though they might go to the latrine, they used the floor instead of the bowl. Finally we got them somewhat educated, and actually, when they left, the troop-compartments were a lot cleaner than after the soldiers we had on the first trip. The odor that come up from the ventilators from below was terrific. I prayed all the way over that they wouldn’t have the temerity to wish poor patients on us for the return trip, as the whole ship needed fumigating. When we got to within sight of Licata, the Moroccans let out the weirdest hollering you ever would want to hear. They had been doing a lot of singing on the way over, particularly at night when there were nothing but blue lights on on the tank deck, but this was different. This time we landed, first again, at the dock of Licata. When the medical officer in charge of evacuation of patients came around and took one look at our tank deck, he hesitated no longer and said we would get no patients. As it was, there were only about 50 to go, so he loaded them on two other ships. Some of the ships also took prisoners back, but we again returned empty. We sat around in the water for a few hours, gave some of our water supply (which we had planned leaving at the dock – but they had no containers for it – 60,000 gal.) to a small British ship. We invited the British Officers aboard while the water was being pumped into their ship, and they were very nice and very interesting. We gave them several loaves of bread, for which they were most appreciative, as they had been living on “dog-biscuits” all the time. They asked me aboard to see one of their men who was spitting up blood at the moment. It turned out that he had a red-hot tonsillitis with some erosion of the superficial vessel. Their Pharmacist-mate was a very intelligent fellow, and all I could do was advise a larger dose of sulfa than he was giving, as he was giving a small dose. 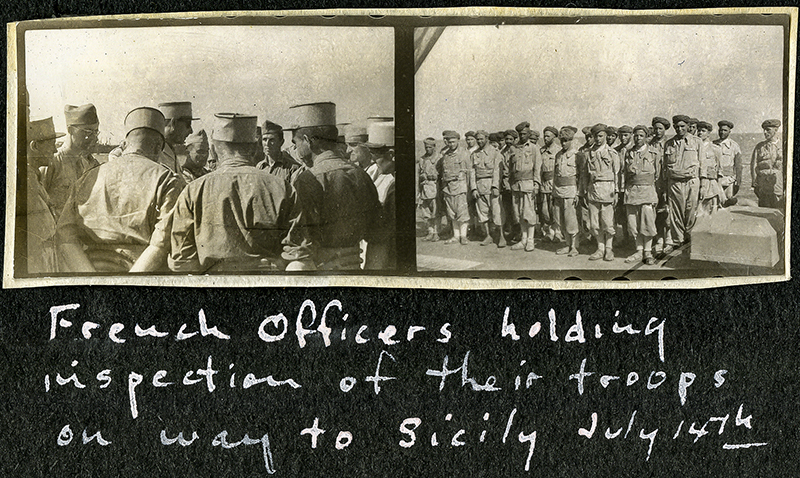 Finally around 11 P.M. the night of the 14th we left and headed home to Bizerte, thankful that we didn’t have to stay all night there, as they had told us that they had nightly bombing. 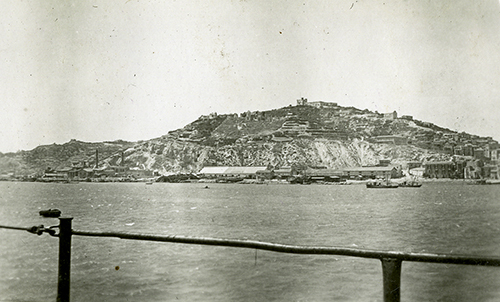 View of Licata, Sicily from René’s ship. 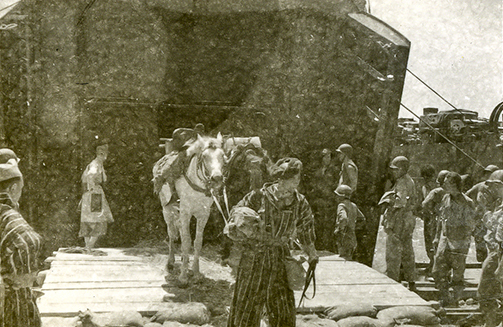 Moroccan soldiers unloading their horses in Sicily.